He was a simple man, a bit of wispy white hair still left on his balding head. It was that black French beret that spoke amazingly well of his artist`s soul, worn along with the garb of his Friar`s robe. He smoked, before his heart got so bad. He never lost his love smelling tobacco. He had another look, his everyday clothes…once someone asked I remove him from our parish hall. They mistook him for someone living on the streets. Personally, I liked to think he choose clothing from the same store as the Maytag Man on the television or was it from a ragbag. Yes, he wore the black French beret with this too. Kept his head warm, he told me. 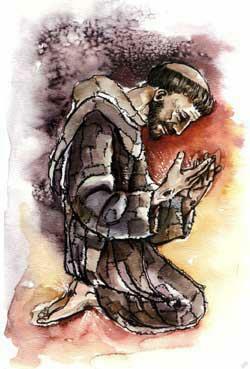 I had never really known a Friar close up, really known one well. A bit like my Father, that I lost much too young. I really loved him deeply [Fr. Emmeran]. The sunflowers he loved were blooming when I heard the news. It was in June. A saint had gone home to God. We didn’t really expect Emmeran that evening, but suddenly he was there. Teach me O my Lord, to be sweet and gentle in all the events of my life – in disappointments and in the thoughtlessness of others – in the insincerity of those I trusted and the unfaithfulness of those on whom I relied. Let me put myself aside; think of the happiness of others; hide my little pains and heartaches so that I may be the only one to suffer by the crosses that come across my path. That they may mellow me, not harden or embitter me. As I go my rounds from one distraction to another let me whisper from time to time a word of love to Thee. May my life be lived full of power for good and strong in its purpose of sanctity. Amen. Fr. Emmeran loved sun flowers.